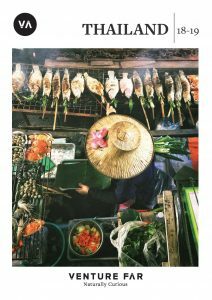 Venture Far has released its 2018-19 Thailand brochure, the latest in its portfolio, with an expanded range of sightseeing, touring, experiential + resort options to tempt + inspire the naturally curious to visit Thailand + go beyond the tourist beaches. The catchphrase “Amazing Thailand” is truly well deserved. Well known beach resort areas in the south, like Phuket, Khao Lak, Krabi + Koh Samui, contrast with the hustle + bustle of Bangkok + the rich cultural history in the ruins of Ayuthaya + Sukhothai. Travel further through the central rice-belt to the historical capital of the Lanna Kingdom, Chiang Mai, or beyond to the north + the Golden Triangle, where Myanmar, Laos + Thailand converge at the mighty Mekong River. There is so much to uncover, discover + learn. Experience true Thai culture + traditions on one of our home stay encounters. Interact ‘one on one’ with local hill tribes on trekking + soft adventure opportunities. Cycle or trek through stunning scenery + witness local life in the slow lane. Then there’s the culinary delights of street food + cooking schools to hone your practical skills. Newly introduced resort icons offer further insight into each property + suitability for “Family + Friends; Romance; Wellness; Luxury + Water-Life”, whilst all-villa properties + resorts also offering villa style accommodation are readily identified with our ‘Villa’ icons. Walking / trekking / cycling are helpfully graded to show the level of activity. • Overland Tours – North + South Thailand as well as in-depth Lanna Kingdom + Sukhothai experiences. • River cruising on the Chao Phaya River from Bangkok to Ayuthaya (3 days / 2 nights) + on the infamous River Kwai (4 days / 3 nights). • An extensive selection of homestay, hill tribe + trekking opportunities, from Bangkok, Phuket + Chiang Mai, all of easy to moderate difficulty grade. • A range of cycling trips from day rides around Bangkok + Ayuthaya to a 2 day / 1 night Khao Yai national park ‘Wine Trails’ ride. • Safari tent style ‘glamping’ at Khao Sok National Park from Phuket. • A selection of no less than 7 Thai cooking school opportunities to choose in Bangkok, Phuket, Koh Samui + Chiang Mai. Prepare Thai food like a local! Download your copy of the new Thailand brochure. 1300 303 343 to start planning your travellers next dream experience to Thailand. Or book online now through ROVE.